We buy and sell clean, sturdy pool tales (slate beds only). We clean and touch up the tables, and have the ability to provide a custom refinish. If you want a bargain on a quality pool table, come see us. Billiard Experts Houston sells, installs and services used pool tables at affordable prices. We also have a full line of game room accessories including cues, wall and floor cue racks, and furniture. Call today and let our trained and certified installers make your next pool table purchase a fantastic addition to your home or pool hall. 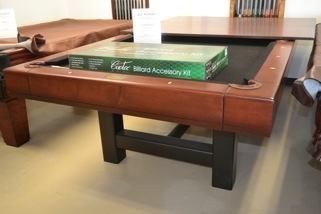 We carry many major brands including Gandy and Brunswick pool tables. Call Ed Nutter’s Billiard Experts Today… (713) 468-3312!